Firstly I like to acknowledge four (no five) really important people without whom this post would not have been possible. His mother who has started the tradition of sending Xav to play at our house sometime in late November, early December with a gingerbread house kit to make. (Though we did have a debate last night at the multiple birthday dinner for all my menfolks' birthdays as to whether two times constitutes a tradition or not). Mel, the middle daughter for nephew minding, gingerbread house construction and her awesome photography skills. I freely admit that the photos of last years creation were pinched / borrowed from her blog Ninjainalabcoat which is sadly in recess due to the pressures of full time study. Most of the rest of the family: Future doctor daughter for icing that sort of looks like snow and the head of the household for remedial gingerbread repair and construction techniques. Here's the 2011 version in its undecorated state with Xav. It did need a bit of repair. Mel described it as resembling "a derelict housing commission house". The finshed version. As well as the original kit, several extra bags of lollies went into decorating the house. (The leftovers went into the housing construction team). And of course Xav felt the urge to destroy it or at least eat it. Sort of reminds me of Godzilla stomping on bad models of downtown Japan. It did survive to Christmas though. This year, the kit was an all in one one with supplied lollies and icing tubes. There weren't a lot of decorations so this year it relies more on the icing than the lollies. The back wall. This is a surrealist Dali-inspired Christmas tree. That's what you getting when the icing runs. The front door and garden. Next year, we may attempt something like this (just joking). 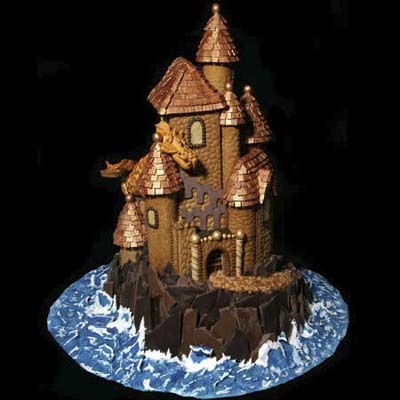 This is by Donna Rorabaugh of Rochester Hills, Michigan winner of the National Gingerbread House competition 2011. However Christmas doesn't have to be all about gingerbread houses. Last year, the eldest daughter gave her sister ninjabread men cookie cutters for Christmas seeing as she is an official semi professional ninja.There are several sets of these floating around amongst the members of our Taekwondo club. One couple even got some as a wedding present. Our chief instructor has been known to bake ninja-shaped cookies with chocolate chips and hundreds and thousands and give them to the good junior ninjas at the end of class. Or how about a gingerbread Tardis? (So need to make one of these).